Five years ago, the group at University of Arizona – Tucson published a simple brain injury classification system that was designed to predict which injuries were likely to progress and need neurosurgical intervention. They called this system BIG for Brain Injury Guidelines. It was created and validated on a group of nearly 4,000 patients over four years, and the results have been promising. Since then, BIG has been validated using small study groups (<405) in pediatric head injury, and at Level I and III trauma centers. One of the Quick Shot presentations at next week’s EAST Annual Scientific Assembly is another validation study at a Level III center in Lake Havasu City, Arizona that introduces one small modification to the guidelines. Normally, BIG is calculated after CT of the head is complete. This modification entailed BIG calculation after anticoagulation was reversed. Patients with BIG scores of 1 or two after reversal was complete were kept at the Level III, and were managed by the trauma surgeons. All BIG 3 patients were transferred to a higher level center. Four years of trauma registry data were analyzed. During the first two years, patients with any positive BIG score were transferred. During the final two years, only patients who scored BIG 3 after reversal were moved. The authors concluded that modified BIG could be used to triage neurotrauma patients for transfer, but cautioned that good clinical judgment should also be applied. Are you satisfied that BIG is sufficiently validated? To date, there are only a handful of validation studies and they have relatively small numbers. Why did you choose to modify the score to wait until anticoagulation? Couldn’t this nullify the validation studies? Do you have any practice guidelines in place to ensure consistent care of the patients you now keep at your center? Do they allow you to manage common problems like subarachnoid hemorrhage or intraparenchymal hemorrhage? How did you ensure that your surgeons, hospitalists, and nurses were comfortable managing these neurotrauma patients? Did you have any educational sessions or other training for things like GCS monitoring and neuro exam? How do you reverse anticoagulation, and how long does that usually take? Plasma and prothrombin complex concentrate are commonly used, but with vastly different reversal times. And what do you do about aspirin, clopidogrel, and the novel oral anticoagulants? Why did you exclude 13 patients once you started using BIG? Has your hospital administration provided any numbers regarding increased revenue from this practice? Your hospital is larger (171 beds), but this type of information will be vital for small, critical access hospitals. This is very interesting work, and highly applicable to rural trauma centers! Successful management of select radiographic intracranial injuries in a rural trauma center without neurosurgeon coverage using a modified brain injury guideline. EAST 2019, Quick Shot Paper #6. 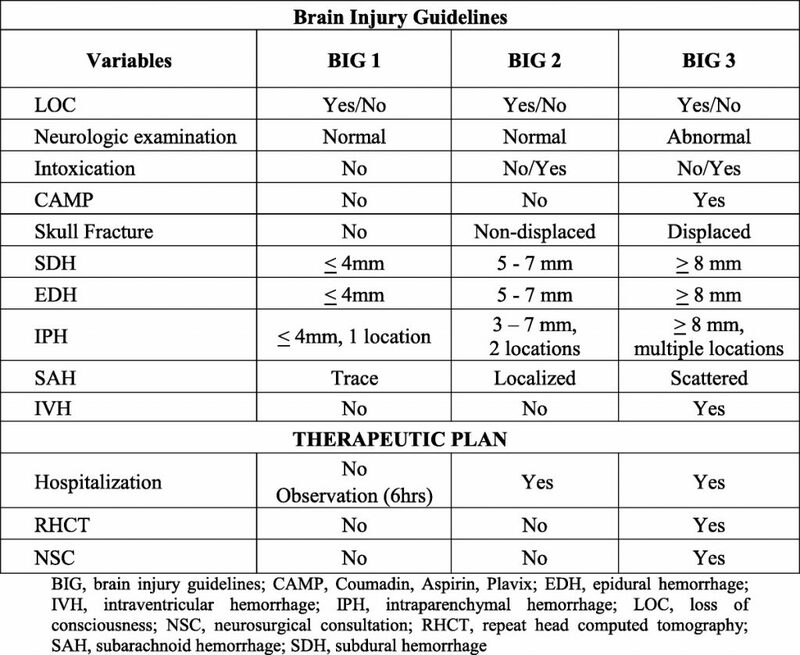 The BIG (brain injury guidelines) project: Defining the management of traumatic brain injury by acute care surgeons. J Trauma 76(4):965-969, 2014. In my last post, I reviewed timing for the 30-minute rules. When does the 30-minute timer actually start? When does it stop? Now that you understand those concepts, we can move on to actually documenting those times. This makes it more difficult to find a common place to record the call time. The two possibilities are paper or electronic. The paper trauma flow sheet is usually only available to the trauma nurse. The others will either use a random piece of paper that gets lost, or doesn’t record it at all. The other option is the electronic medical record (EMR). Everyone involved with the resuscitation probably has access to it. What’s the best option? This depends on your hospital. For paper, develop a process such that one person who has access to the trauma flow sheet (usually the nurse) is responsible for entering the call time. Otherwise, develop a specific template in your EMR so that whoever enters it does it the same way. And make sure that everyone who could possibly write the call time note knows how to properly create it. Now, what about documenting consultant arrival? This is the most difficult part of the process. Once again, there are two alternatives: human factors or technology. Many programs try to rely on technology. Unfortunately, it is frequently flawed. The EMR timestamp when the consult is entered always occurs after the patient was seen. Badge swipes can be forgotten. The most reliable method relies on personal responsibility. Your consultant must take a moment to check the time when he or she enters the room to examine the patient. They can then record that time when they write their note. And if they really want to be cool, they can also note the time they were called in the note. Best practice: Have the trauma attending personally make the call to the specialist. And in that conversation, have them mention that “this is a 30–minute criterion consult.” This ensures that both your surgeon and consultant know that their presence is expected promptly. And maintain an expectation that the consultant will properly document their arrival time. I hope you enjoyed this series. If you have any comments or questions, or want to share tips from your program, please leave a comment below or shout it out on Twitter. In my last post, I reviewed the first component of the 30-minute rules, the actual criteria themselves. It’s not called a 30-minute response rule for no reason. There is an absolutely required time to respond that has been set at 30 minutes. Today, I’ll look at an equally important component: the response time itself. Why do we have it, and when does the event start and stop? What is the actual time interval that must be measured? First, it does not start when the clinical condition in the criterion is recognized. If a patient has a large subdural hematoma with shift on CT scan, a radiologist must bring it to the attention of the advanced practice provider, emergency physician, or surgeon, who must then take the next step. The timer actually starts when the clinician causes the specialist to be notified. This may occur when the clerk pages or calls them, or when the clinicians do it directly. One point of confusion: the clock does not start when the clinician responds to the page or call. What if they don’t call back for 45 minutes? Do they then have another 30 minutes to get to the hospital? No!! It starts when the first notification goes out. So when does the clock stop? This one is easy. It occurs when the specialist who has been called gets to the patient’s bedside and begins the assessment. One final thing about the clock? Does the clinician have to respond within the 30-minute time frame on every patient? Ideally, this would be great but it’s not realistic. There is no guidance in the Orange Book about a threshold. But if past experience is any indication, it is most likely a timely response somewhere around 80% of the time. But strive for perfection! Tomorrow, I’ll list some ways to address the most challenging part of the 30-minute rules: actually recording the response times. And I’ll provide a best practice to help meet it. The 30-Minute Rules: What Are They Exactly? Yesterday, I talked about the new 30-minute rules for orthopedics and neurosurgery in general terms. Today, I’ll write about the who and what. The rules state that a service representative “must be present and respond within 30 minutes based on institutional-specific criteria.” The response needs to be in person and not by phone. But who can it be? The Clarification Document states that the response can be met by an orthopedic surgery resident, mid-level provider, or the orthopedic surgeon. However, if a resident or midlevel respond, they must document their communication with the orthopedic surgeon in their note. The neurosurgery service representative is not as clearly spelled out. However, it is presumed that this person meets the same requirements as for orthopedics: resident, midlevel, or neurosurgeon. Select only a few. Three is a good number. Any more than this will tax your specialists. 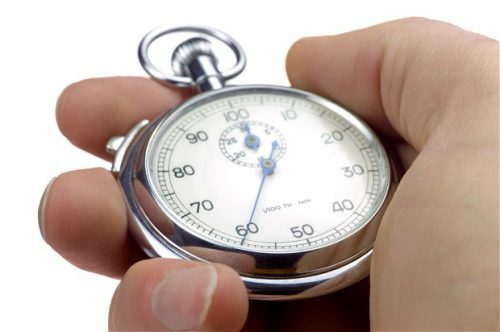 Choose good criteria that your orthopedic surgeon or neurosurgeon would absolutely want to be there in 30 minutes for. See my examples below. Make sure they are very specific. Vague terms like “TBI” or “open fracture” would result in your specialist being called in way too often. Ensure that the criteria do not rely on the judgement of the specialist. For example, language such as “a subdural requiring operative intervention” requires the neurosurgeon to pass judgment from home and should be avoided. One exception to the previous point: futile neurotrauma care. Your neurosurgeon may review the images from outside the trauma bay and pronounce the care futile. However, they should document this clearly in a note in the chart as soon as possible. And they had better not change their mind later. This is not a comprehensive, list, but hopefully you get the idea. Each center needs to develop their own list, with input from their specialists. Once agreed upon, these should be put into policy and approved at the trauma program operations committee. I’m kicking of a week-long series for trauma program leaders that explains the details of a trauma center requirement that creates confusion for many. With the adoption of the 2014 Resources for Optimal Care of the Injured Patient (i.e. The Orange Book), a number of new requirements were introduced to obtain and maintain status as an American College of Surgeons verified trauma center. One (or actually two) of the requirements for Level I and II centers are known collectively as the 30-minute rules. The 30-minute rules apply to both orthopedic surgeons and neurosurgeons. They state that care must be continuously available and that a service representative “must be present and respond within 30 minutes based on institutional-specific criteria.” And most who peruse the Orange Book have already realized, any phrase that contains the word must denotes that failure to meet the requirement will result in a deficiency during a site review, whereas the word shall means that it will likely result in a weakness. For the rest of the week, I’ll work through these requirements. I will describe what they mean and what some typical institutional-specific criteria are. I will explain who is actually required to respond. I’ll work through the logistics of being able to accurately record their response time, and offer best practices for how to capture it. And finally, I’ll look at the consequences of not meeting these criteria. Tomorrow: Typical criteria for orthopedic surgery and orthopedics.